New Prince Matric. Hr. Sec. 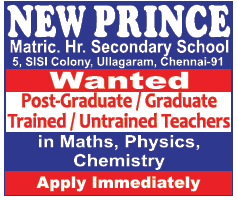 School, Chennai has advertised in THE HINDU Classified newspaper for the recruitment of Teachers PGT / TGT jobs vacancies. Interested and eligible job aspirants are requested to apply immediately from 07th October 2018. Check out further more details below. About School : New Prince Matric. Hr. Sec. School, Chennai is a private school in Chennai, Tamil Nadu.